Michael Cohen, arriving at Trump Tower in New York in January 2017, has pleaded guilty to tax evasion, lying to Congress and violating campaign finance laws and faces a three-year prison sentence beginning in March. The man who once bragged that he “would take a bullet for the president” would later release a recording he had secretly made of Donald Trump discussing hush-money payments. (Washington Post photo by Jabin Botsford). Even while doting on "Mr. Trump," as he called his boss, Michael Cohen was squarely focused on his own ambitions. 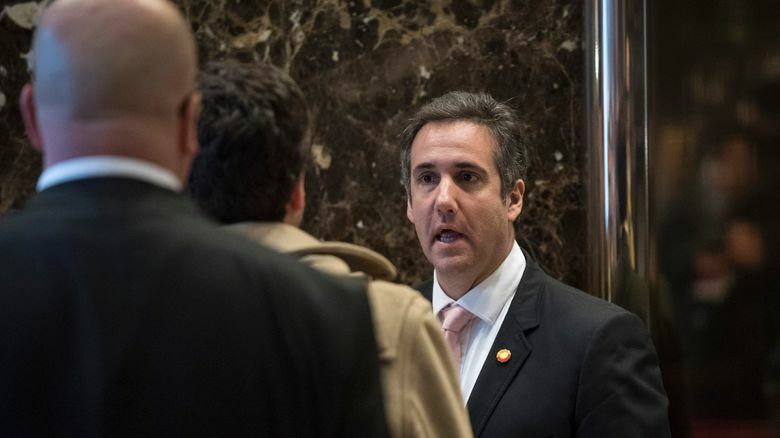 Now, as he prepares to testify before two congressional committees this month and faces a three-year prison sentence beginning in March, Cohen finds himself repeatedly denigrated by the man he publicly revered. Trump was Cohen’s potential pathway to prestigious new titles: mayor, congressman, even White House chief of staff. After Trump’s election, as he waited for a Washington job that never came, Cohen sold himself to corporations as a direct line to the new president. Rudy Giuliani, the former New York mayor and now one of the president’s attorneys, said Cohen’s claim to loyalty is undermined by his decision to secretly record a phone call with Trump while serving as his lawyer. Cohen grew up in Lawrence, New York, surrounded by prosperous lawyers, doctors and business executives. His mother, Sondra, was a nurse. His father, Maurice, a surgeon, was born in Poland in 1935 and survived the “gulags of Siberia,” according to a letter he wrote to the judge who sentenced his son. “People look at me and ask, ‘Is everything OK?’ It has taken a toll on all of us,” Levine said, meaning Cohen’s parents, three siblings, aunts, uncles and cousins. Over the years, the El Caribe has hosted a cross section of New York life — families from Brooklyn, high-school proms, Democratic and Republican organizations, a panoply of religious groups, and Italian and Russian mobsters, some of whom were also Levine’s patients. Cohen loved to show off his ties to Trump — even at one of his son’s baseball games, where he ran into Melissa Solomon, an elementary-school classmate. Cohen dove into New York’s real-estate market. He bought a $1 million condo in Trump World Tower near the United Nations, where his parents and in-laws also purchased apartments. Four years later, he spent $5 million to buy into Trump Park Avenue, where Trump’s daughter Ivanka Trump and her husband, Jared Kushner, owned condos. In 2014, Cohen sold four Manhattan buildings for $32 million, three times what he had paid several years earlier. “Check out the attachment of me with the ‘Donald,’ ” Cohen wrote in a 2006 email to Gene Freidman, who managed his taxi medallions. The following year, Trump hired Cohen as a $500,000-a-year in-house counsel.